A working week that began with the Tories co-opting Bob Geldof on to the globalisation and global poverty policy group ends with David Cameron co-opting Mahatma Gandhi. “The Conservative Party can look forward to 2006 confident in our values, clear about our direction, and optimistic about the future. “I wish all our members and supporters a Happy New Year. This is an exciting time to be a Conservative. We’re at the start of a process of change, becoming a Party which is more like modern Britain, and which likes modern Britain more; a Party in tune with the aspirations of the British people; a Party with a clear message of change, optimism and hope. Well thats something. 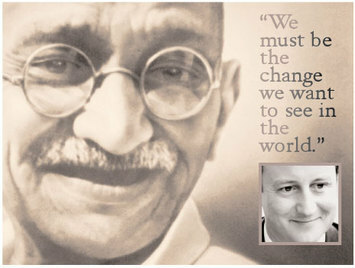 Gandhi, who never supported violence as a way of getting things done compared to Cameron, who supported the War on Iraq. The mesage is lovely, it is, but when it comes down to it, its just a New Years message and clearly has no substance to it, nor should it be expected. Can this man not publish anything free of platitudes? One thing Im a little concerned here is about rather than Cameron co-opting Gandhi is the idea that Cameron is comparing himself to Gandhi. Lets be in no confusion here, Cameron is nothing compared to Gandhi. Also strictly applying this to the current proposed changes for the Party, does Britain want a world where equality is forced on the people and sexual discrimination justified because its fairer than allowing people to fight on a fair platform? Invoking Gandhi. We have indeed a new take on Conservatism. I would have thought that our Ed would have commented on the lack of Christian content in this message. I wouldn't.. New Years Day is inspired by chronology not theology, Selsdon. “The Conservative Party can look forward to 2006 devoid of our values, unclear about our direction, and worried about the future." I'm getting sick of it. My infatuation with the Boy King is over. May the May elections turn into a disaster. The right-wing's getting angry! Mainly because they can't cope with the tories being popular again...and their man lost the leadership battle. Though I don't think using Ghandi's image was a good idea. Jaz - Thatcher won three general elections. That is real popularity - millions of real votes. Opinions polls are mere snapshots before the real battle. By the way Jaz, how do think Cameron would have fared against Fox in the country? - Away from the treachery of the Commons Committee Rooms. Thatcher did win, unfortuntely that was 18 years ago... Plenty of time for political shift. It's...er...an INTERESTING choice of imagery and not one I would have thought of. But if it's intended to keep up the imagery as part of the charm offensive with AB progressives that currently vote Lib Dem, then what the heck? Nice line from Gandhi, Michael - but then Gandhi didn't have to fight marginal seat campaigns with direct mail, news grabs and push polling. Who's said that the Britain Cameron wants us to reflect is actually the Britain the people want? Cameron's message was aimed at a wider audience than the nit-picking, whining little pratts who regularly post on this blog. "I want us to usher in a new type of politics in this country: constructive, thoughtful and open-minded. " Because the rest of us were advocating being destructive, thoughtless and close-minded. "And I want every single member and supporter of the Conservative Party to remember that personal commitment is the most powerful way to bring about change: as Gandhi said, “we must be the change we want to see in the world.”"
What does this mean? If one wishes to see the change of "lower taxes" how does one "be" low taxes? Oh, but of course: he wasn't talking about *policy* (Cameron doesn't care so much about that stuff). He was talking about *image*. So this Gandhi quote is about purging the Tory Party of its maleness and whiteness. In the words of Greg Dyke, the Tories are still too "hideously white", and that, of course, must stop. Because we all know that whiteness and maleness is not "in tune" with "modern Britain". "We’re at the start of a process of change, becoming a Party which is more like modern Britain"
Am I the only one who thinks that Joe (or Joanna) Average out there doesn't particularly care about how many women MPs the Tories have? Or how "diverse" they are? Why is the focus on "modern Britain" so often on its "minorities"? By definition, minorities are in the minority, so how does it reflect the nation to have disproportionate numbers of them? This focus on the image of the party just comes across as both narcissistic and masochistic. Narsissistic because Cameron spends so much time talking about what the Tories look like, or "reflecting modern Britain" (whatever that is), and hardly any time paying attention to what the British public care about (he cares more about pushing the buttons of the media than those of the public); and masochistic because this whole phase we are going through represents what has been so wrong with the Tory Party for so long, and indeed what is wrong with the country as well: white liberal self-loathing. David Cameron should apologise for being white, male, heterosexual and rich, because in this day and age those are the greatest sins there are. Please, please, please can we stop hand-wringing and self-flagellating? Can we please get over all this rubbish about "change"? Let's accept what we are, be proud of what we are, and stand up for what we believe. I don't think it wins converts to conservativism (at least in the long run) to pretend that conservativism in the past was terrible and nasty, and now that we have changed that we have nothing to do with our past. In lieu of attacking the opposition (we need to be "consensual", you see) Cameron has turned his guns on old-school Conservatives (i.e. Thatcherites and Tebbitites). When he talks about "change" or bringing about change (which he does incessantly), he does NOT mean bringing about change in the country, because he is explicitly presenting himself as continuity for Blairism. Instead the only change he represents is an abandonment of all conservative values. But what good does that do for those who happen to believe in those values? Do we go along with the self-flagellation in the belief that this will be a "de-nastification" process? We must change because old conservativism is awful, sinful and nasty. Conservativism *was* nasty. Even the Conservatives themselves came to believe it before they eventually abandoned it. So of course it was true. Are you calling me and a large number of other Cameron-critical posters on this blog a "nit-picking, whining little pratt"? I think you should take that back. I thinks thats a disgraceful way of commenting on other posters here. LOL! I'm sure they could have found a better photo to use. I initially thought it was Alf Garnett! Editor, I'd like to nominate Agent Smith's comment above for "Conservative Home Comment of the Year". Gold. "Gandhi, who never supported violence as a way of getting things done..."
Sorry, wrong. Gandhi was a far more complex figure than the cardboard saint he's been imagined into, particularly outside India. He was actively involved in organizing volunteer units among the Asian population in South Africa during the First World War; later, he admitted that resorting to force would be the only way to have kept Germany and/or Japan out of India, since unlike the UK they were regimes without a conscience. Over time, he gradually became not just a pacifist but something of a glorifier of mass suicide to a degree that, personally, I can only describe as demented. He wrote that the Jews of Europe shouldn't try to resist Hitler but should instead go peacefully to their deaths in the hope of changing German hearts, even if no hearts were thereby changed; likewise, during the massacres that followed the partition of India, he scolded those of his countrymen who ran from the slaughter rather than simply accepting death. In short, the modern glorification of him notwithstanding, Gandhi was, in my mind at least, kind of a schmuck. "The Conservative Party can look forward to 2006 confident in our values, clear about our direction, and optimistic about the future." Really? I thought the party had never been more uncertain about its values. It no longer believes in letting people keep more of what they earn, instead vacillating between talk of redistribution and of no tax rises. "Our central objective in 2006, as a modern, compassionate Conservative Party, is to apply all our energies to tackling the big long-term challenges faced by Britain and the world." So who thought we should tacke short term challenges of no concern to anyone? "I want us to usher in a new type of politics in this country: constructive, thoughtful and open-minded." And who's been advocating destructive, thoughtless and closed-minded politics? "as Gandhi said, “we must be the change we want to see in the world.”"
And this means what? How are you supposed to be better public services? Lower taxes? Or a street that's safe to walk down at night? Or does Cameron just mean we should look nice and moderate, and that's all? I suspect he does. Yes, I'm sure modern Witney is nice, but perhaps Dave would like to go into town on a Friday night and then tell us *exactly* which part of the diorama he wants us to be more like. "and which likes modern Britain more"
As opposed to those poor befuddled old Conservatives who wanted to change Britain for the better? "a Party in tune with the aspirations of the British people"
So British people aspire to leave the EPP and have more women MPs? "a Party with a clear message of change, optimism and hope." If you like Britain as it is, what exactly are you proposing to change? Or are you just referring to taking the Conservatism out of the Conservative Party? "I hope that we can inspire many more people to be part of it in 2006." But if you want to keep them, they'll actually have to believe in something they want to campaign for, and the image led personality cult we have at the moment just won't do that. Yes, the way John Skinner conducts himself would tend to reinforce that opinion. "He admitted that resorting to force would be the only way to have kept Germany and/or Japan out of India, since unlike the UK they were regimes without a conscience..."
Whilst I certainly wouldn't compare the UK to the abhorrent wartime regimes in Germany and Japan, the British record in India was hardly whiter-than-white - Churchill turned a blind eye to a severe famine in India and the Amritsar massacre stands out as one of the several regrettable episodes that those (hello Mr Hitchens, hello Mr Heffer) who believe we should all view the imperial era with nothing less than wistful, uncritical nostalgia would do well to remember. "In short, the modern glorification of him notwithstanding, Gandhi was, in my mind at least, kind of a schmuck." I think that that is a pretty fair conclusion. He was also very hostile to any form of industrialisation, and advocated the kind of economic policies that would have kept most Indians desperately poor. As an indian it was Ghandi and Nehru's ideas that practically set india backa good few decades in development, they allied themselves with a mixture of communist and western policies leading to frankly poor economic growth. However, ghandi was one of the men who stands out in the world to fight foreign occupation without the use of terrorism to achieve a goal. You know in English literature classes in school, when you break down a book into thousands of different meanings and messages and as a result you never enjoy the book again - guys it's the holidays you really should have something more productive to do than pick holes in every word. If you have the answer to win the next election that get into the House of Commons quick smart - otherwise don't be so damn picky. Cameron is doing well, he wants us to have a Happy New Year & he thinks Ghandi was a good man - there's no controversy there! It's the holidays for some Kate but not all and certainly not the retail, service and leisure sector - thank you to everyone that works to keep everyone else happy in the 'holidays' and a special thank you of course to the people who have to police and mop up the mess of our fantastic modern Britain. Oops sorry that's not very on message of me is it? It is interesting that Mr Cameron should quote Gandhi; presumably to demonstrate that the Conservative Party no longer considers itself to be the "Nasty Party" and the Party can also share the feeling of self loathing for being dominatated by white men as shared by the BBC and begs forgiveness?. However, I have had so much brain washing by Cameron, May, Maude and co that I can now only think of the Conservatives as being the "Nasty Party" and the comments prefacing what I have to say offers some evidence. According to Penderel Moon in his book 'Divide and Quit', he was employed as a district magistrate by an Indian Prince at, during and after the time that Britain was negotiating to give India home rule; Gandhi, Jinnah and the Indian Congress were politically responsible for the savagery that ensued when the new borders were created and Gandhi was much to blame. "Gandhi by being uncooperative with the Brtish Army was in reality assisting the Japanese to conquer India" or words to that effect. I would like to see the proof where Churchill "turned a blind eye to famine in India", as quoted above. India, a vast, often inaccessible country suffered famines before the arrival of the British. The British mitigated these famines by persuading Indian merchants to sell grain to areas enduring famine instead of holding on to food to increase its price - it is what is known as 'Free Trade'. I don't suppose Attenborough bothered to mention it in his film'Gandhi'.There are still famines in the world today. This is what Churchill said about the disgraceful massacre in Amritsar in response to what might have been a situation involving rioting: "The incident in Jallian Wala Bagh was an extraordinary event, a monstrous event, an event which stands in singular and sinister isolation". Dyer's action was condemned worldwide. He was officially censured by the British Government, then resigned in 1920. Dyer was the officer that gave that mainly Indian and Gurkher troops the order to fire. When the British were in the Indian sub continent, during a hundred years the Indians experienced nothing like the blood letting that occurred immediately after the British left. And if there was something that was achieved it was the British, under General Napier, that put a stop to the barbaric custom of 'Suttee'(I believe that is the spelling) whereby the wife was thrown onto the funeral pyre of her dead husband (the BBC never told me that, and it was stopped by a method it, or Cameron, would not approve of - capital punishment). Somehow the dream ticket of Cameron and Gandhi does not appeal. very sorry for many comments - ghandi in himself was an angel to the world. Ghandi in many respects reflects the conservative party. He led people together and stood against what he himself, and his people stood against. This is what the conservative party see - they see that although Brown's time as PM started well, he is now indecisive about the future. His confusion around when a election is tgo be held just shows how uncertain he is - he does not know the people for who they are. Cameron is a realistic guy who has experienced the world for what it is. He is a sign of the new world politics - the changing Britain politics that are needed in a confusing time. Queries on what is so confusing is answered from assessment of two things - society and the economy. Society is turning to a new stage in which armed violence is increasing as the economy strengthens. The quaterny economy that is strongly emerging globally means that restrictions are difficult. Us as the voter have seen Brown and the Labour party deal with these issues for ten years. Time for change is needed so silly restrictions are not taken. The UK has figures for huge road acidents, yet more restrictions are put in place. The issue that needs to be dealt with are roads and the struggling infrastructure that is developing. However maybe opening the slip road may helkp with this. The point of this post is to say we need a government that is going to fuocus on the people as well as outside factors. Camerons decentralisation of power shows that the conservative party is ready for this. Brown however seems to enjoy power now that he is threatening 'Iran's oil interests unless it curbes nuclear ambition'. Change is needed soon and good luck to Cameron. "becoming a Party which is more like modern Britain, and which likes modern Britain more"
"a Party in tune with the aspirations of the British people". The aspirations of the British people are mainly conservative. The aspirations of the Conservative party are Marxist. Cameron gives it away with the line about becoming more like Modern Britain. Obama used a similiar line recently, and it is the classic trick of the Marxist. You tell people that the ideal had moved away from you, and that you must change to catch up. This is how the Marxists have changed this country from the greatest in the world, to one of the shoddiest. To me, Camerons language marks him out as an out and out Marxist, and more trouble for this country. Don't vote for him.